How Many Hippos Live Together? While common hippopotamuses (Hippopotamus amphibius) are companionable and very social animals, their smaller relatives, pygmy hippopotamuses (Choeropsis liberiensis) usually prefer to go it alone. Physical size isn't the only thing that separates the planet's two hippopotamus species. While you'll rarely see a common hippo by his lonesome, pygmy hippos are solitary creatures through and through. Common hippos live communal lifestyles and are by no means loners. They often live in units of upwards of 30 individuals, a mix of both youngsters and their mothers. These often loud groups always have single dominant male "leaders" watching closely over things. These units are frequently referred to by names such as sieges, herds, pods or bloats, according to Animal Bytes of the San Diego Zoo. Although common hippos are indeed companionable animals, they don't establish lifelong adult ties to each other, notes the San Diego Zoo. The members of the large living groups also can change very easily -- nothing is set in stone. Hippo bloats are by no means "forever" situations. Although pygmy hippos look a lot like common hippos, not only are they a lot smaller, they lead totally different day-to-day lifestyles. These nocturnal and reclusive mammals live independently and are often found on their own. Exceptions do exist, however. Pygmy hippos occasionally live in groups of two or in tiny family groups that consist of the parents and one offspring. These guys are much meeker than common hippos. 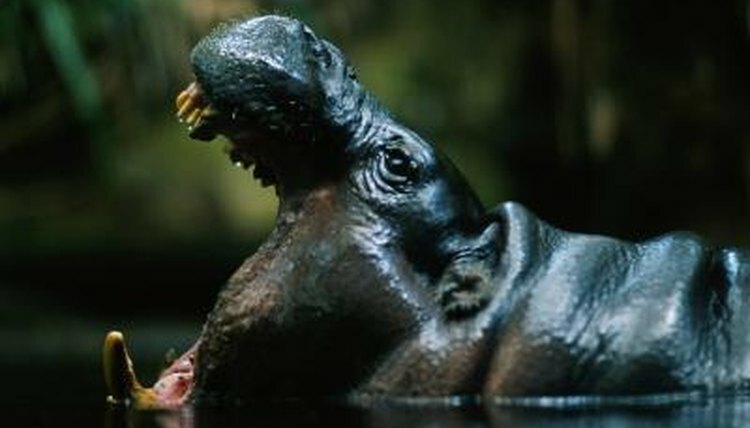 For the most part, however, pygmy hippos only require interaction for mating purposes. Living alone is natural to these hippos, and they thrive on it. Although pygmy hippos don't usually spend a lot of time with each other, they're not exactly hostile when they do encounter one another, according to the Pygmy Hippo Foundation. Instead of attempting to attack strange members of their species, they usually opt to pay them no mind at all. Despite this, pygmy hippos can be very protective when it comes to defending their turf.